It was a beautiful day today. We have had several days of rain, but the last couple of days have been clear. # people came to work in the garden. One new person I met at Home Grown Culver City. We pulled out all the zucchini and tomato plants on the hillside and dug up the soil. I plan on planting vetch to restore nitrogen and other minerals to the soil there. The tomatoes, zucchini, squash, watermelon and cantaloupe did not do well up there. The soil needs to be amended for next spring. Pruned all the tomato plants. I am going to have some great roots for my root installation exhibition. Planted a row of carrots and a row of green onions in the raised bed, where peas were formerly planted. Harvested lettuce, cherry tomatoes, Roma tomatoes, carrots, green onions, rosemary, oregano and pak choi. Have to plant more pak choi next time around. 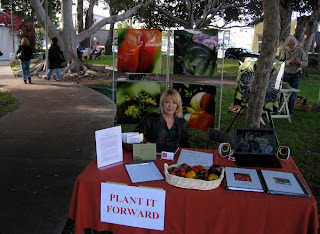 Plant It Forward-the starving artist project had a unique opportunity to publicize its work at the first Home Grown Culver City on Saturday, October 23 from 9 a.m. to 5 p.m. at Media Park in Culver City. Closeup photos of the vegetables, a video showing interviews with the artists and two journals (the artists' journal and the creator's journal) were on display. Other exhibitions included workshops and demonstrations, food vendors, designers of edible gardens, specialists in the fields of composting, vermiculture, permaculture, bee keeping and backyard chickens. Not doing too much with the garden these days. Down to the last few heirloom tomatoes. Still quite a few bell peppers. Only see 1 eggplant. However, all the fall vegetables are doing fine: pak choi, Swiss chard, lettuce, arugula. I planted more radishes, broccoli and lettuce last week. It has been raining a lot the last few days and everything is coming up. No gardening today due to the rain. The turnips and parsnips are up, but not ready to harvest. The kale will be ready soon. Didn't end up planting anything on Saturday. Just pruned and watered. However, today, I planted radishes, broccoli and royal oak leaf lettuce. Harvested beets, pak choi, arugula, cherry tomatoes, Roma tomatoes, Brandywine and Beefsteak tomatoes, thyme, rosemary and bell peppers. A good day! Juna came to work--thank goodness! I'm here alone today. Not too much to do. I will prune a little and plan on planting more carrots, onions, broccoli and what else? I will have to look in my box of seeds. More later. Yes, it rained for 3 days. Filled up both 50 gallon containers behind the studio with rainwater diverted from the roof. I had just planted carrots and lettuce, so this rain was great. I pulled out all the rapini. It just bolted and never produced any vegetable. Haven't had much luck with rapini. It is supposed to be a cool weather crop, as is broccoli (the broccoli didn't come up at all). Guess I will try again. Buy more seeds? Better check. 2 caterpillars and 3 grasshoppers. Yesterday it was 7 caterpillars, no grasshoppers. Where are all these insects coming from? You hardly saw any all summer. I guess it's the heat wave--there all coming out for one last hurrah! Did lots of pruning of dead leaves on the tomato plants. Pulled out two of the smaller tomato plants, which were not in the main garden. Harvested lots of Roma tomatoes, carrots, arugula, red leaf lettuce, eggplant, bell peppers. Planted more carrots and arugula. The parsnips and turnips are looking good, as is the kale and pak choi. I only planted one row of each. Last spring I planted two rows each of the kale and pak choi and it was too much.